The idea to facilitate an “embodied reading group” came from our desire to work with David Grossman’s powerful book, Falling Out of Time. Written after the death of his son, Uri, who died in active military service during the 2006 Lebanon War, Falling Out of Time erupts like a volcano, fueled by a dense emotional core composed of grief and longing and love and astonishment. On the page, the words assemble like a poem. Characters with enigmatic names—Town Chronicler, Duke, Woman in Nets, Cobbler, Midwife, Centaur, and more—speak poetic fragments that slowly piece themselves together into a deep meditation on the unfulfillable desire to go there, there where the dead abscond, there towards which all our cries are directed but from which no echo escapes. Or rather, Grossman himself pieces this narrative together by writing portions of his own psyche, it seems, into each of the characters. A fragmented narrative told by fractured characters who unfold from the mind and heart of a broken father whose writerly instincts and drive illuminate the depths of grief for his readers. This is Falling Out of Time. We wanted to help members of our Asheville community to journey into Grossman’s words so as to find language to express their own experiences of grief, and thus the “embodied reading group” was formed. All reading is embodied. Unfortunately, this truth is ignored (avoided?) in many educational environments. As teachers, we have heard from many students that reading is hard because it seems abstract, disconnected from the lived experience of the students themselves. On top of that, reading is assigned and thus it is a chore. The remedy for these legitimate concerns is, we explain, to re-approach the practice of reading as if it was a new event. This approach takes time, however, and time is usually in short supply in traditional learning environments where students are pulled between multiple classes, extra-curricular activities, and “real life,” which, sadly, appears too often as some dimension of reality that exists beyond the walls of school. Fortunately, in the environment of a reading group, where memories of “school” are surely active but muted by years of other experiences, a new kind of reading is possible. In this case, we decided to employ our theatre experience to supplement our discussions of the book with activities that could help participants send their awareness to the ways their bodies were processing Grossman’s visceral literature. In this way, the “embodied” dimension of reading would, as always, be present but it would be foregrounded and honored as an essential part of the meaning-making process. 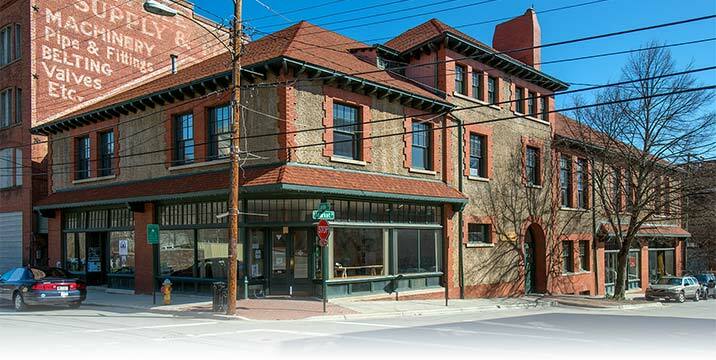 A small group of us met once a week for four weeks at THE BLOCK off biltmore in downtown Asheville. Following prompts that Joanne and I (Will) prepared, the group became acquainted with Grossman’s book and started formulating questions: Who are these people? What’s the deal with this Centaur, and what is the story of all these children’s toys packed into the room around him? Why is the Town Chronicler writing down information about the characters’ lives? Is he really a Town Chronicler? Who appointed him? Where is this there toward which all the characters eventually move? Spliced into the conversation, we would engage in physical activities that sought to bring the key themes of the book into the cells of our bones and muscles. We designed one of these activities to grapple with the specific temporal dimension of grief. After all, the book is called Falling Out of Time. What might that mean? For us, it meant falling out of chronological time, or, rather, being ejected from the linear time that contemporary society pretends is the only kind of time. The activity asks everyone to walk casually around the room, following no particular path. The only instruction at first is to let the arms fall to the sides of your body and to keep your gaze out toward the horizon. Gradually, we introduce new instructions: without thinking too much, make a gesture that expresses your past self, the self before you intimately knew grief. Allow the gesture to come out in stages, as if you were drafting it. Gradually it will grow to the size it needs to be. And then after playing with that gesture, we move on to the present. Find a gesture that expresses who you are in the present. And then, once that has grown into its necessary size and shape, we find a gesture that expresses who we think we might be in the future. All of this takes place over several minutes. But the crux of the exercise is what comes next. We ask that, when Will claps his hands, each person enact all of the gestures all at once. Not one after the other, but simultaneously. Will claps, and then claps again a few moments later. People giggle as they do something that seems a bit impossible. But everyone does it, and then, after six claps or so, we rest and discuss. Camille Flammarion's L'atmosphere (1888). An image of nonlinear time? In grief, the hard (if imagined) distinction between past and present breaks down. The past always rides along with the present, shaping our vision of other people and the world around us. The future, too, which may indeed seem unthinkable or even undesirable, folds into the present and lingers there like a coiled snake. Is the snake going to strike at us, or is it a spirit animal guiding us? When the past and the future merge with the present, a short-circuit occurs. Time itself sends out sparks and all the lights go out. Our bodies readjust to the absence of the previous temporal scheme and our minds struggle to keep up with the stored knowledge of our bodies. The act of performing your gestures all at once, the gestures that express the totality of your perceived past, present, and future selves, allows you to respond positively to this new, thick NOW. That is, instead of perceiving the short-circuit as an attack, you become the one who yanks the wires. The laughter released during the exercise that unfolded within our reading group denotes the (possibly? maybe?) enjoyable sensation of saying yes to what otherwise might seem like a coup d’état, or coup de temp. The death of a loved one sends us falling out of time, but perhaps this act of falling is an entrance into another mode of reality, one that seems necessary and meaningful. Grossman’s book ultimately challenges each of its readers to explore this entrance. Early in the book, a husband and wife, who we learn have lived in silence for years, tune into a mysterious frequency. The man, receiving this frequency through some antenna in his soul, declares, “I have to go […] there.” The specifics of this destination are, at first, entirely unclear. His wife wants nothing to do with this message or the man’s mission. But the man goes nonetheless and the impulse to move instigates a chain reaction, a sea change of internal and external movement that each character hasn’t sensed in years due to the trauma of their individual losses. The movement of this single character sends him to the edges of town where he walks and walks and walks without aim until, one by one, the other characters join him. The impulse of one person to face grief and death head on inspires others to do the same. Collectively, the grievers find a sense of direction. The entrance into another mode of reality becomes visible once they follow the heading emitted through the invisible frequency first sensed by the man. We read the book to join the movement and discover the contours of this new reality along with the characters. From left to right: Jack Pelton, Said Osio, and Will Daddario. At THE BLOCK off biltmore. After the four-week reading group, we learned several things. First, it is possible to establish a sense of community with strangers and, more than that, to construct a shared vocabulary capable of engaging with difficult topics like grief/death/life/loss. Second, the mixture of structured conversation and physical activities allows people to shift between collective and personal grief, which, it seems, helps each person to honor the unique qualities of her/his/their grief in a public setting. Grossman’s book is an excellent guide for this type of work since his poetic language gives us access to each character’s inner world while also revealing the benefits of leaving our inner worlds in order to commune with fellow grievers. We are grateful to everyone who joined us for this journey, especially Said Osio of Third Messenger who prompted us to move quickly with the idea once it came up. If this experiment sounds interesting to you, then please send us an email and let us know, whether or not you live in the Asheville area. This information will help us plan for the next event and generate ideas for other texts that we might wish to explore via in-person or online formats.